While you may know which grains, fruits, vegetables and protein foods are safe on your soy- and gluten-free diet, you may not have given any thought to the oil you use in cooking. Luckily, there are a number of healthy cooking oils safe for you to include in your diet. Soy is one of the most common food allergies, according to Food Allergy Research and Education, and while allergic reactions tend to be mild in most cases, they can lead to anaphylaxis. Because soy is a common food allergen, foods that contain it are required to provide a clear and visible ingredient statement indicating as much. Soy is in a variety of foods, including cereals, cookies and low-fat peanut butter. Soybean oil and may be one of the oils used in products that contain vegetable oils. Gluten is a grain protein found in wheat, rye and barley. People who are sensitive to gluten, which includes those with celiac disease and nonceliac gluten sensitivity, need to avoid foods that contain these ingredients to prevent reactions. For people with celiac disease, eating foods that contain gluten can cause serious damage to the digestive tract, while those with nonceliac gluten sensitivity experience some digestive stress but no permanent damage, according to the University of Chicago Celiac Disease Center. Oils are generally not a source of gluten, although they may come in contact with the protein if manufactured in a facility that also makes gluten-containing foods. Olive oil is a naturally soy- and gluten-free cooking oil. It has a distinct fruity flavor and makes a good oil choice for light stir-fries and quick sautés. The light olive oil works well in baked goods due to its milder flavor. If cooking at very high temperatures, however, extra virgin and virgin olive oil are not the best choices. 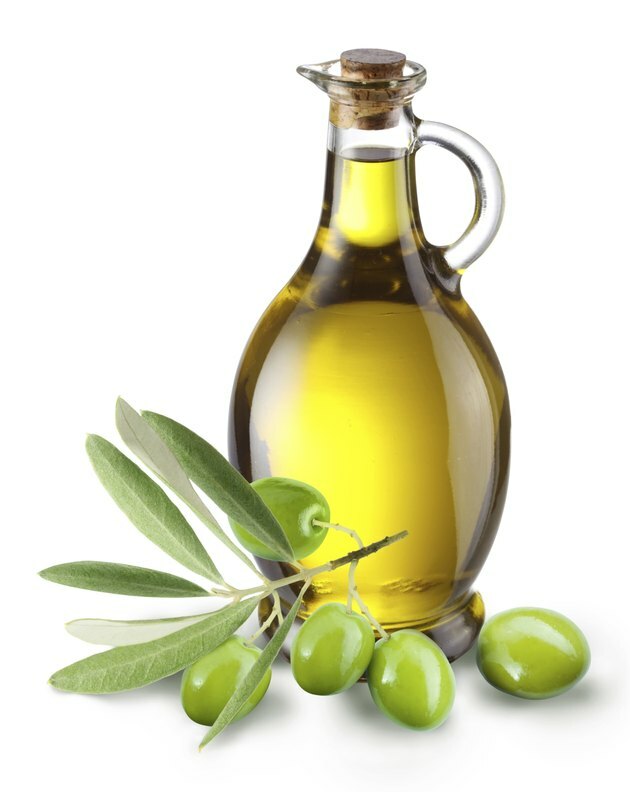 Olive oil is high in monounsaturated fat, which may help lower cholesterol, and a good source of the antioxidant vitamin E . One tablespoon has 124 calories, 14 grams of fat and meets 10 percent of the daily value for vitamins E and K.
Canola oil, also known as rapeseed oil, is also free of soy and gluten. It's not as flavorful as olive oil and makes a good all-purpose cooking oil choice. You can use it in any recipe asking for a vegetable oil. One tablespoon of canola oil has 124 calories, 14 grams of fat and meets 12 percent of the daily value of vitamin E and vitamin K. Like olive oil, canola oil is also rich in monounsaturated fats. When you are avoiding soy and gluten in your diet, sunflower oil also makes a good choice. It is light in color, has very little flavor and makes a good all-around cooking oil. You can also use it for your oil base in a homemade salad dressing. Unlike olive and canola oil, sunflower oil is rich in polyunsaturated fats, which are also good for your heart and help reduce cholesterol levels. Additionally, polyunsaturated fats are a source of the essential omega-3 and omega-6 fatty acids. One tablespoon of sunflower oil has 124 calories and 14 grams of fat and meets 28 percent of the daily value for vitamin E.
The University of Chicago Celiac Disease Center: What's the Difference Between Celiac Disease, Gluten-Intolerance, Non-Celiac Gluten Sensitivity and Wheat Allergy? Does Vitamin E Skin Oil Have Side Effects?